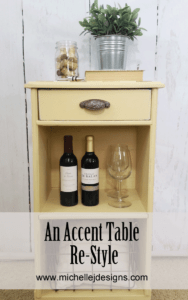 I am excited to have used the Old Fashioned Milk Paint! Hi! 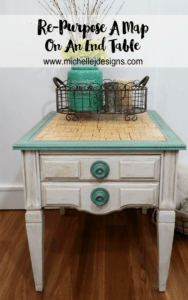 I am so happy to announce that I was chosen to be a blogger for the Old Fashioned Milk Paint Company. I can’t wait to show you my first project. 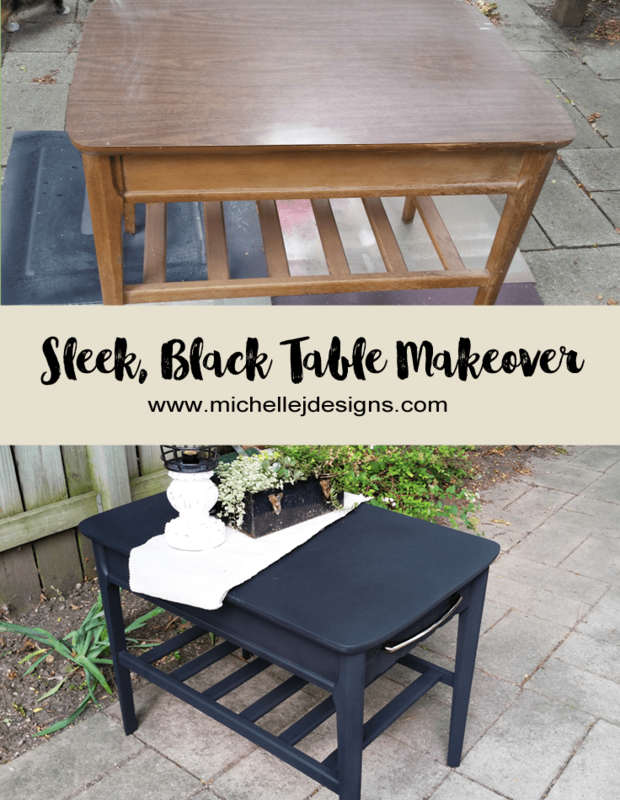 A sleek, black table makeover! 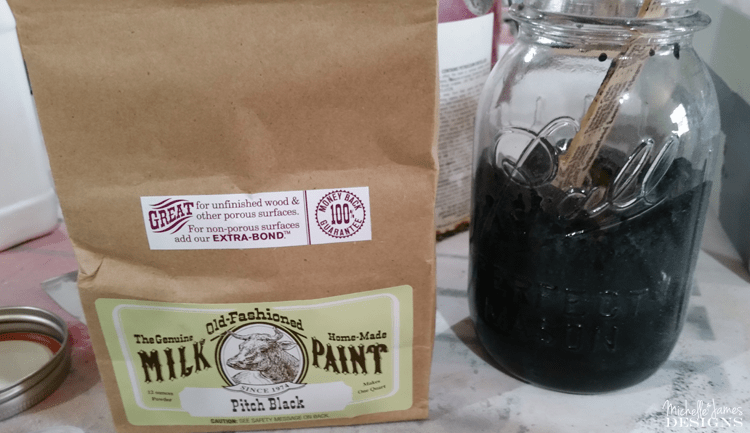 I had never used milk paint before but had heard many good things about it. This is the first project I have completed with this brand of paint and I have to say I am happy with the results. 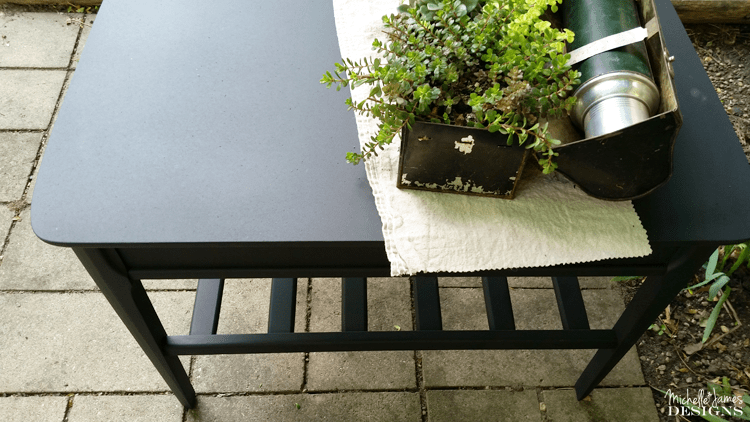 This table is a little out of my normal design style but this makeover is for Brian and his new apartment. 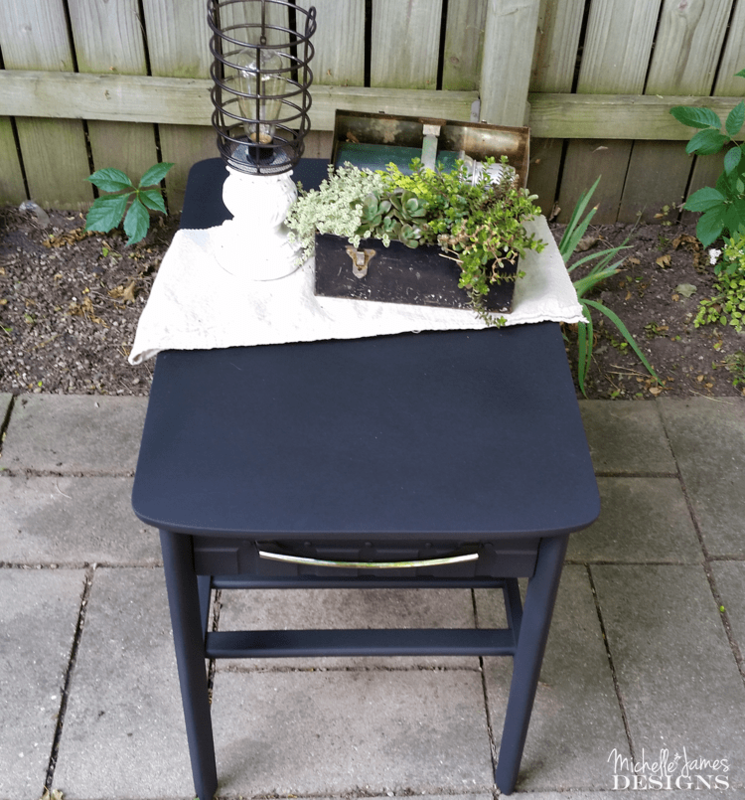 He wanted flat black so I used the Pitch Black color and created this sleek, black table makeover! This is a sponsored post. I received product from the Old Fashioned Milk Paint Company to complete this project but all opinions are 100% my own. You can see my disclosure here. 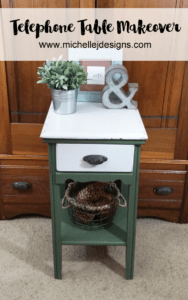 If you haven’t heard of Old Fashioned Milk Paint they created this recipe in 1974 to provide an authentic finish for antiques and refinishing. The product is environmentally friendly and is made from milk protein, lime, clay and earth pigments such as ochre, umber, iron oxide, etc. And it is totally safe for most people who are allergic to modern paints. It is also great for people with certain medical conditions. There is a slight milky odor when it is applied but completely odorless when dry. The paint is in a powder form and you mix it with water. You would think this would be a giant paint but it wasn’t. I mix paint for my sprayer anyway so it worked out fine and was easy to mix. I used a mason jar. But after it is mixed you probably only want to keep it for about two weeks. I tried not to mix any more than I needed. 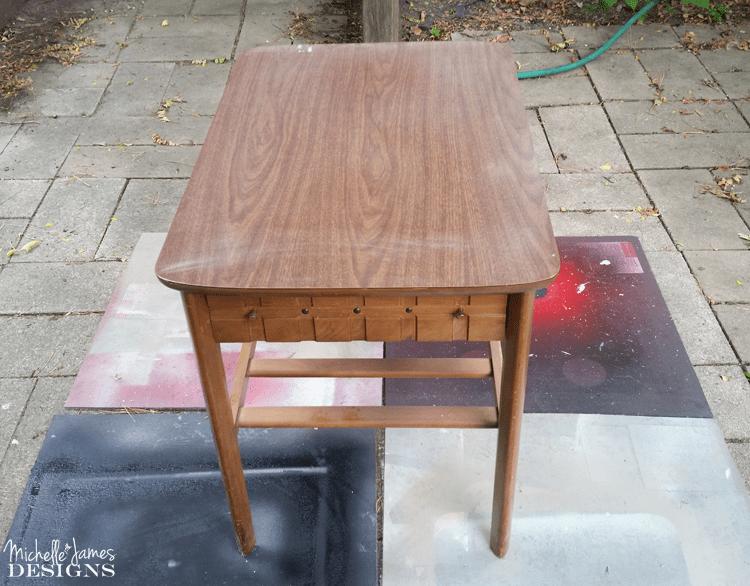 Now this table has a formica top. So I added some of the Extra-Bond in with the paint. 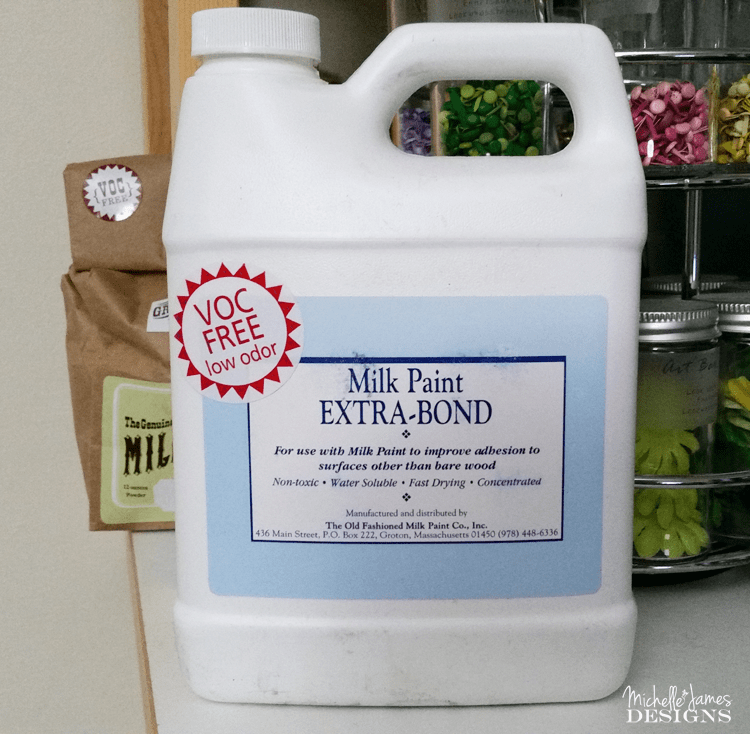 Once applied as the first coat it helps the paint to bond to non-porous surfaces. It looks great so far. It is going in Brian’s apartment so if it holds up there…it will hold up anywhere. Am I right? 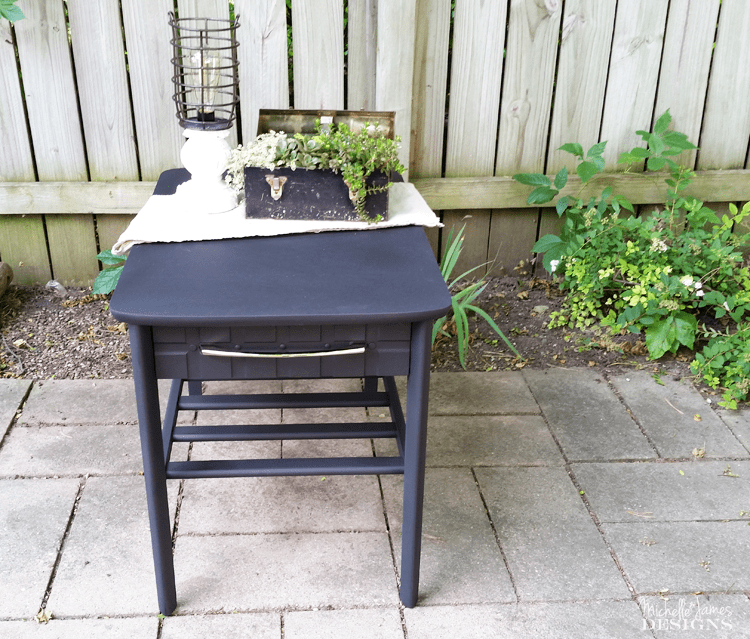 So now that you have a little milk paint education we will move on to this awesome, sleek, black table! I mixed up the paint then added the Extra-Bond to it. I added it to the sprayer and went to town. I added a couple of coats. Then when it was completely dry I added a sleek drawer pull across the front of the drawer. It is much easier to use the drawer now. I was so excited to choose my colors that I forgot to add a sealer onto my order. So, the sealer will be here soon and I will be adding a coat for some extra durability. I think it will hold up well. What do you think? Will is be nice in the boys’ apartment? It think it will work just fine. If you like it please pin it!! I have to say that I am really happy with it and I can’t wait to see it in it’s new home. Thank you Peggy! I am glad you stopped by to take a peek. Now I have to make your bottle opener for your new T@B! I can’t wait to get started! Thank you Anj! 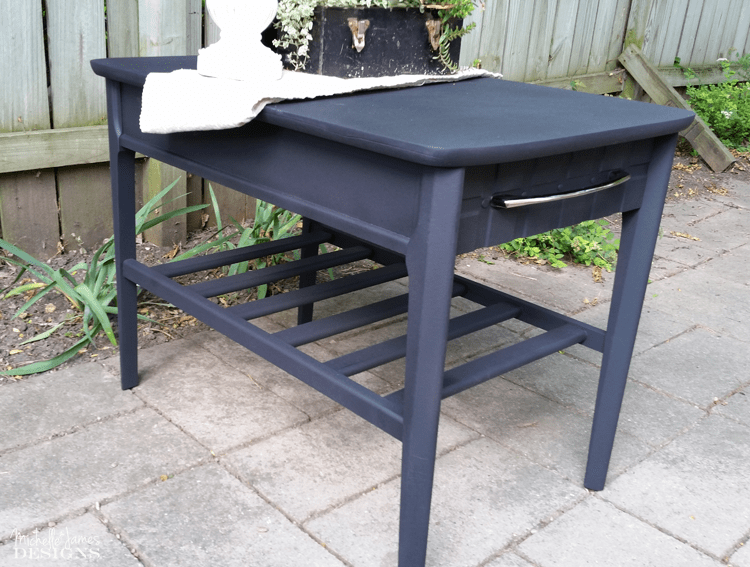 Yes I have seen your wonderful, black painted furniture pieces on your blog. They are stunning! It was fun to do. Beautiful new look!! The table was just boring and ordinary before you got your hands on it. This paint looks like lots of fun, I can’t wait to give it a try! 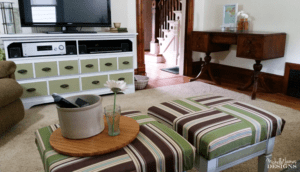 Thanks for sharing another awesome project Michelle!! Thanks Heather! It was fun to use the pitch black color. I may have to use it again soon! It is out of my norm but it really grew on me. Beautifully done! Love the color so much and the application with the sprayer makes the process look so easy. I’m sure your son will be thrilled to have it…if not….I’ll PM you my address. Lol… Congrats on a great makeover. Thanks Qs! I really like it a lot! Maybe he won’t get it after all. LOL! Your table turned out amazing! Thank you Dana! I don’t usually use the black paint very much but I like it. I may even use it on something of mine. LOL! This looks fantastic! I was wondering whether it would scuff, but I’ll bet the sealer will help with that. It looks like the paint went on really evenly, too. Great job, and I love the drawer pull! It did go on really well and so far so good even without the sealer. Of course it is not being used at the moment. I hope it holds up. I love that Extra-Bond. It seems to really help the paint stick. I am so glad you like it. Thanks so much for stopping! What a beautiful transformation. I love black furniture. It looks so sleek and sassy 🙂 Great job transforming your table Michelle. I love it. I like sassy! Thank you Carolann. I appreciate the comment and I am glad you like it. Thanks Lacey! I am very happy to represent them and I love their paint. I am so glad you like the little table! Michelle, what kind of paint sprayer do you use? 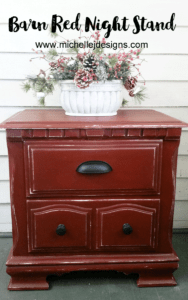 I have a dresser and a chest to paint and I think a sprayer would give me the best finish. Any other suggestions? I want a semi gloss finish. Hi Beth! I love the HomeRight Finish Max paint sprayer. https://michellejdesigns.com/favorite-things-store/ This is a link to my favorite things store. You can see it there. It is really easy to use and you can put any paint in it so you can get any finish you want from matte to gloss. 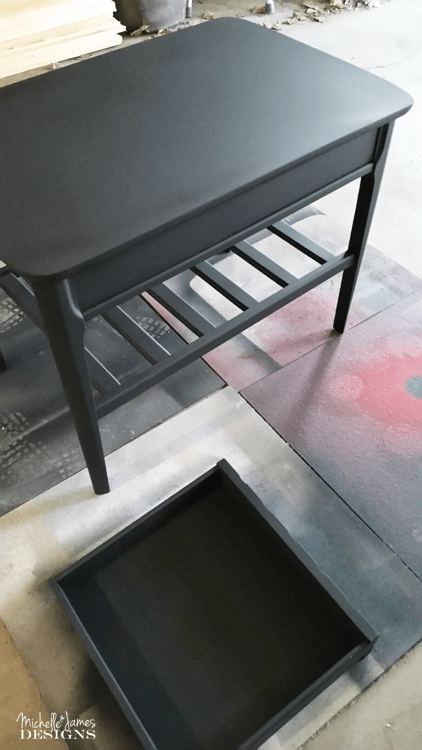 You do have to thin the paint a little as with any sprayer but it is easy to do. If for some reason that affiliate link doesn’t work you can go onto my site and at the top in the menu bar is “shop” then click on My Favorite Things Store. It is on the 3rd page of the tool and paints. 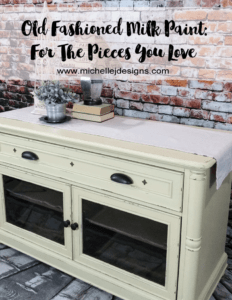 You will really be glad you got it for those pieces and the drawers. It makes quick work of them. Thanks for stopping by! Hi Susie! Thanks so much. It was a little out of my normal so I had a lot of fun with it! My favorite OFMP finish is a sleek no chippy finish. Didn’t work for me this time but your is fab! Gonna tray a sleek white with my left over paint! Nice job, as always! Thank you Sue! 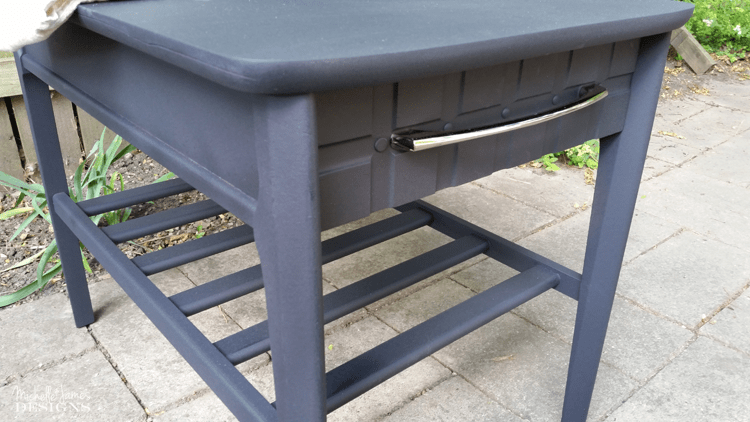 Since this was my first attempt with the milk paint I was happy with the results. It is nice to know others like it too. Thank you for commenting! I do like it and think it now looks elegant and yet modern bachelor pad table for the boys, so you win designer of the day award. I pinned as I do so many of your projects. Thank you Sue. 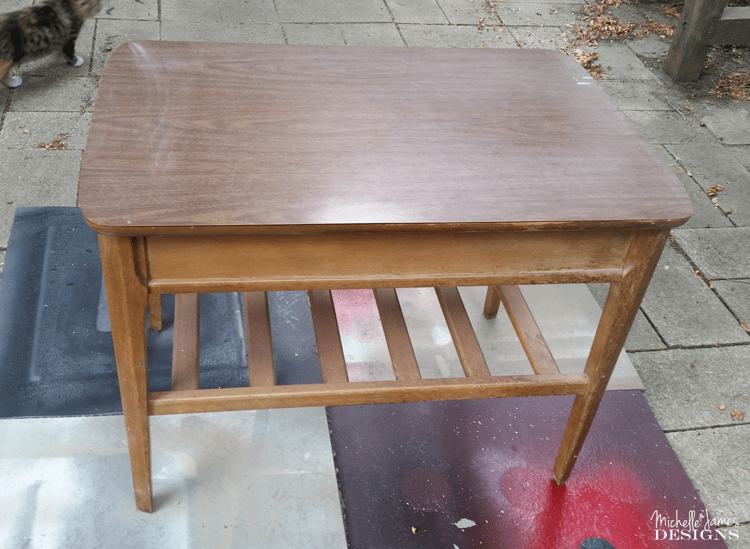 This table is off to it’s new home in the college apartment. I hope it stands a chance with those boys. LOL! Thanks so much for stopping by and thanks for pinning!